TO OPERATE: SHAKE BEFORE USING. Turn nozzle to “spray” or “stream” position before using. Hold sprayer 18 to 24 inches from foliage or surfaces being treated. Direct the spray so that upper and lower surfaces are contacted. Use caution on new growth and tender foliage. To control insects named, apply this spray to provide thorough coverage of upper and lower leaf surfaces. Repeat treatment weekly or as needed to control infestations. May be applied on day of harvest. DO NOT TRANSPORT OR STORE UNDER 32°F. If freezing occurs, thaw and agitate vigorously. Do not apply more than 10 times per season. 24 fl oz treats 32 sq ft (8 ft x 4 ft). Asparagus, beans, broccoli, Brussels sprouts, cabbage, cauliflower, celery, collards, cranberries, eggplant, kale, lettuce, mustard greens, peppers, potatoes, radishes, spinach, tomatoes, turnips. Asparagus beetles, aphids, blister beetles, cabbage loopers, Colorado potato beetles, cross-striped cabbageworms, diamondback moth larvae, fireworms, flea beetles, green peach aphids, harlequin bugs, imported cabbageworms, leafhoppers, leaftiers, mealybugs, Mexican bean beetles, 12-spotted cucumber beetles, stink bugs, webworms, whiteflies. African violets, asters, azaleas, begonias, camellias, carnations, chrysanthemums, dahlias, dogwoods, geraniums, gladioli, marigolds, roses, wandering Jews. Aphids, flea beetles, leafhoppers, mealybugs, whiteflies. Treat plants and flowers as soon as insects appear. Spray plants and flowers, making sure to penetrate dense foliage. Repeat application every seven days or as necessary for control. Aphids, flea beetles, leafhoppers, mealybugs, whiteflies. Treat as soon as insects emerge (usually late spring). Treat leaves, branches and tree trunks evenly, making sure to penetrate dense foliage. Repeat application every seven days as necessary for control. Eastern and forest tent caterpillars, gypsy moth caterpillars and adults, adult Japanese beetles. This product is ideal for use on most vegetables, herbs, fruits and nuts including, but not limited to: almond, apple, apricot, arugula, basil, bean, beet, blackberry, blackeyed peas, blueberry, broccoli, Brussels sprouts, cabbage, chamomile, cantaloupe, carrot, casaba, cashew, cauliflower, celery, cherry, chicory, chives, corn, cranberry, currant, curry leaf, eggplant, elderberry, endive, garden peas, garlic, grape, grapefruit, honeydew, horseradish, kumquat, lemon, lentils, lime, lettuce, loganberry, loquat, macadamia nut, mango melon, melon, mint, nectarine, onion, orange, paprika, parsley, peach, pear (bitter melon), pepper (including bell, chili), pimentos, plum, potato, pumpkin, radish, raspberry, sage, snap bean, soybeans, spinach, strawberry, summer squash, sweet bay (bayleaf), sweet potato, Swiss chard, tangelo, tangerine, tomato, walnut, watermelon, yam, zucchini. 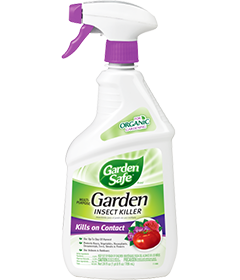 This product kills most harmful garden insects including, but not limited to: ants, aphids, armyworms, bagworms, beetles, cankerworms, caterpillars (including tent), centipedes, chiggers, chinch bugs, cicadas, clover mites, corn borers, corn earworms, crane flies, crickets, cutworms, digger wasps, earwigs, firebrats, fruit flies, gnats, grasshoppers, green bugs, green fruitworms, green June beetles, horseflies, Japanese beetles, katydids, lace bugs, leafhoppers, leafminers, leafrollers, maggots, mealybugs, millipedes, mites, moths, pillbugs, rootworms, scales, silverfish, sowbugs, spider mites, spittlebugs, stink bugs, thrips, tomato hornworms, webworms (including garden, sod), weevils.